The Bush Kidz Early Years Learning Framework has been developed for the children in our care aged from 6 weeks to 6 years old. 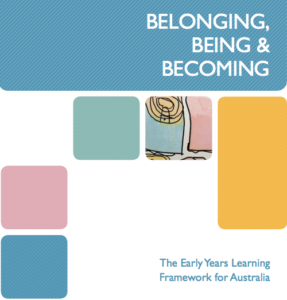 It is underpinned by the Early Years Learning Framework and a practise of emergent curriculum. Bush Kidz program enhances community engagement through inviting members of the community into the centre to aid and participate in the programming for developing children’s learning. When children are exposed to a wider community group and see the involvement they have in the centre, their learning is enhanced through what those members of the community can offer. They experience belonging. Bush Kidz values fundraising activities for the community and sponsors a child through World Vision. Children have also participated as part of a group for Shave for a Cure, Red Nose Day and Jeans for Jeans Day. Children’s lives are characterised by being, belonging and becoming. Bush Kidz supports this view of the child being, by providing an environment where the child has time to be, to seek and to make meaning of the world. The environment includes internal spaces that are child-orientated, encourage exploration , contain resources that are open-ended to encourage discovery, exploration and imagination. Outdoor spaces are bursting with natural elements such as gardens, dirt and sand pits, bike tracks, mounds, ampi-theatres and animal farms. Becoming describes the process of rapid change as young children grow. Bush Kidz was created to allow children to take risks and extend their opportunities and increase their achievements as they grow older and become more independent and competent learners. The centre utilises Learning Stories to record information about children’s learning journeys whilst in our care. Learning journeys are steered at children achieving learning outcomes as outlined in the Early Years Learning Framework. Each childs journey is recorded individually and parents receive a detailed developmental report bi-yearly which allows parent to see how their child is moving forward in their learning journey. Parents will also receive an electronic copy of their childs portfolio which contains photos, artwork and documentation about your child’s development.